Fred fakes illness so he and Barney can get out of taking their wives to the opera. Using prehistoric helicopter as a means of escape, the two of them join their bowling team for a night of fun. They almost get away with their scheme, until loose-lipped Barney gives away their night's activities. Believing he has made Wilma and Betty disappear through magic, Fred capitalizes on his newfound freedom by taking Barney to a nightclub, the Rockland, where an old friend, trumpeter Hot Lips Hannigan, is performing. The jazz is cool until the wives show up to teach their wayward husbands a lesson. Fred and Barney jointly build a swimming pool, but Barney hogs the pool time, angering Fred. To get even, Fred hires a pal to pose as a police officer and break up one of his neighbor's pool parties. Fred uses his influence with a business friend to obtain a job for Barney, who becomes a furniture repossessor. To the dismay of both, Barney's first assignment is to repossess Fred's television! Unwilling to betray his friend, Barney pays off Fred's delinquent television bill with his first paycheck. A conk on the head turns Fred into an aristocratic sophisticate, whose behavior manages to disrupt the entire city of Bedrock. A Hollyrock film company goes on location in Bedrock to film its new feature Monster From The Tar Pits, and gullible Fred is enlisted as stand-in for star Gary Granite. But Fred's real problems begin when Wilma and Betty audition for roles in the film and end up going ga-ga upon meeting movie stars Rock Pile and Wednesday Tuesday. Roped into babysitting little Egbert, the child of a friend, Fred and Barney take the tot over to the pal Joe Rockhead's house to watch the fights on television. Egbert befriends Joe's pet runtosaurus and dresses the creature up in his baby clothes, which results in chaos when the pet--whom Fred and Barney mistake for the baby--escapes from the house and dashes up a tree. To finance their dream of opening a pool hall, Fred and Barney visit the dinosaur racetrack where Fred bets his entire paycheck on a long shot. He tells Wilma that he has lost his check. When the long shot pays off, Fred and Barney are initially elated, but they quickly realize their problems are only beginning. Barney decides to surprise Betty with a belated engagement ring, which he gives to Fred for safekeeping. But Wilma discovers the ring and assumes it is a gift for her. Not wanting to shatter her illusions, Fred decides to buy a second ring, but doesn't have the cash. He cons Barney into going several rounds with a boxing champ in order to win a $500 prize. Wilma and Betty win a trip to Hollyrock from a television contest. Finding themselves lonely and bored, Fred and Barney take vacations from work and follow them out. When Wilma is ""discovered,"" Fred muscles his own way into the world of television to bring her back. Fred's victory in The Loyal Order of Dinosaurs golf tournament is soured when club president Barney withholds his trophy for nonpayment of club dues. Fred retaliates by demanding that Barney return every item he has borrowed over the years. The stalemate continues until Wilma and Betty manage to bring their husbands back together. Barney hides the sweepstakes ticket he and Fred have bought in the lining of an old coat, which Betty subsequently gives to a passing hobo. While the boys try to recover the ticket, convinced it is the winning one, Wilma and Betty have their own winning ticket stashed away at the Rubble's house. Fed up with their jobs, Fred and Barney secretly plan to buy a restaurant, but then Fred has to deal with a suspicious Wilma who wants to know why two young girls (carhops who are seeking a job) are calling for him, and what the messages regarding two tons of dino-burger meat mean. With a burglar on the loose in Bedrock, Betty decides to take judo lessons to protect herself. When Wilma wants to take lesson also, Fred ridicules the idea, arguing that one glimpse of a burglar would send her running in fear. To prove his point, Fred poses as the burglar and sneaks into the Rubble household, on the same night the real criminal shows up. Fred and Barney decide to treat their wives to a night out, at an amusement park. Fred cuts a song at a recording booth as a souvenir but misplaces the record. It is later discovered by a group of teens who pass it along to a deejay, and Fred is suddenly transformed into unwitting rock star ""Hi-Fye."" Fred and Barney sign up for dance lessons at Arthur Quarry's so that they do not humiliate themselves at the charity ball. 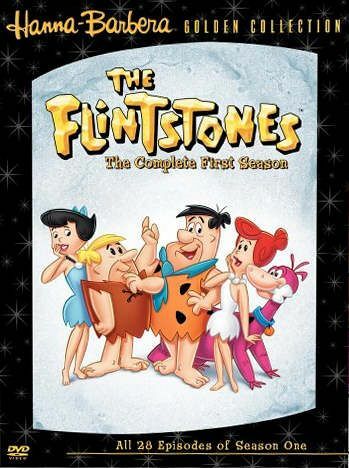 Their excuse that they have joined the volunteer fire department falls apart when Betty and Wilma realize that the all-stone town of Bedrock is fire proof. The wives then suspect that their husbands are slipping out to meet other women. When he discovers a bag containing $86,000, Fred's dreams of being a wealthy man finally seem to be coming true. But the money has been stolen from the bank, so Wilma and Betty force Fred and Barney to return the money to the bank, and unwittingly set them up as the primary suspects! The wives set a trap for the real culprits and Fred ends up saving the day. Would-be hunter Fred convinces Wilma and the Rubbles to spend their vacation time in the mountains, hunting for snorkasaurus. Fred is successful in his hunt, but he gets more than he bargained for when the wives insist that the snorkasaurus be taken home as their new pet, Dino. To commemorate his tenth wedding anniversary (which he only remembers because it falls on ""Trash Day""), Fred wants to buy Wilma a Stoneway piano. He finds a hot deal--ultimately too hot--from a shady, cash-only businessman named 88 Fingers Louie. While attempting to demonstrate his skill as a hypnotist to his wife and the Rubbles, Fred manages to hypnotize Barney into thinking that he is a frisky puppy, and is then unable to bring him back. Jealous Fred's discovery of a love poem that was sent to Wilma prompts him to hire Bedrock's top detective Perry Gunite, to find out who the home-wrecking poet is. Gunite's investigation mistakenly points to Barney. Fred plans revenge against his friend until Wilma reminds her husband that he had written the poem himself years earlier during their courtship. When industrial tycoon J.L. Gotrocks decides he wants to rub shoulders with the common people, dead-ringer Fred is hired to fill in for him in the board room. Fred savors his new lifestyle at the country club, but the plan begins to unravel when J.L. demonstrates little tolerance for the common folk. Thinking they are undergoing an examination for a physical contest, Fred and Barney mistakenly sign up for a three-year stint in the Army! After a tearful goodbye to their wives they enter into the service, where they quickly blunder their way into volunteering for the first lunar landing mission. Friend Gus Gravel invites the Flintstones and the Rubbles to his seaside hotel for an all-expense-paid vacation. But upon arriving, the four find that the hotel's planned ""activities"" seem more like work. Gus finally confesses that his entire hotel staff has just resigned on the eve of a huge convention. Wilma and Betty are finalists in a television bake-off, but on the eve of the event, they contract measles. Donning wigs and dresses, Fred and Barney take their places in the contest. Assuming the command of a Boy Scout troop, Fred quickly learns the hazards of a ""routine"" camping trip. Fred blunders his way through until an overnight flood leaves him and the troop hanging on a tree limb over a treacherous waterfall, hoping a ranger will rescue them. Tired of hearing their husbands complain about finances, Wilma and Betty rent rooms to piano and bongo-playing student musicians. Fred and Barney go along with the arrangement, unaware that their wives are providing the lodging in return for music and dancing lessons. Fred agrees to appear in a before-and-after weight reduction commercial, but is humiliated to learn that he is the before example. An offer of $1,000 if he can drop twenty-five pounds in a month fails miserably, as does every other diet plan, until an overeaters group takes him on as a challenge.